In the style and tradition of “Three views of Eastern Orthodoxy and Evangelicalism” edited by Brad Nasif et al., Craig Ott has now brought together five significant missiologists from major Christian traditions to reflect on the Mission of the Church. This fascinating volume invites the five authors to first state there understanding of the Mission of God and then to respond to their fellow authors. The book has its weaknesses but contains much to stimulate debate and set an agenda for further inter-confessional enrichment. The two major drawbacks of this collection of essays are firstly, as Ott admits in his introduction, that of the five chosen authors four are North American men, and secondly that the Orthodox input is limited to a contribution from an Eastern Orthodox Church in North America with no voice from Eastern Europe or the Oriental Orthodox Churches. That said the five authors do bring to the table Roman Catholic, Conciliar, Evangelical and Orthodox perspectives. They are Stephen Bevans, Darrell Guder, Ruth Padilla DeBorst, Edward Rommen and Ed Stetzer. The focus of the debate is clearly missiological but this inevitable leads into an exploration of soteriology, Christology and eccleciology. All authors are agreed that there has been, over the past fifty years, a very significant convergence between their traditions which has placed both Trinitarian theology and the Missio Dei centre stage. 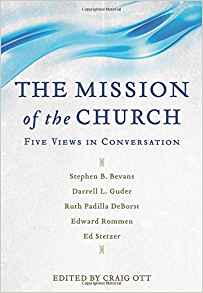 Related agreements around the primacy of the church in mission, apostalicity as its primary characteristic in mission and the missional significance of (Eucharistic) community are also very much in evidence and are explored at some depth. When it comes to embracing the holistic nature of mission there is often a greater sense of agreement between our Roman Catholic, Conciliar and Latino conversation partners than between the two evangelicals with Stetzer still wishing to retain an element of ‘priority’ for the verbal proclamation of the Gospel. Ion Bria’s language of “the liturgy after the liturgy” as an expression of a commitment to ensuring that our mystical union with Christ embraces the broken world with healing and reconciling life, is not only used by Rommen. The area of greatest difficulty appears to be ecclesiology, something we have experienced during several of the LOI consultations. What, or who, constitutes the church and how; the relationship between the church and the Kingdom (or reign) of God; and the relationship between church and mission are all warmly, if not hotly, contested. Rommen in particular adopts a rigorous approach to apostalicity which, he maintains, can one be achieved through verified apostolic succession. He suggests that only such apostolic churches have the capacity (and ecclesial authority) to engage in mission. He asks of all mission movements “are [your] staff members legitimate successors of the apostles or simply hired help?” It is interesting that none of his conversation partners directly challenge this point or offer alternative approached to legitimate apostalicity. Finally, my greatest disappointment was that what I had expected to be the Orthodox gift to this debate is in fact missing. There is none of that rich vein of apophatic faith which helps us grasp, or rather be grasped by, the mystery of the mission of God – the unknowability of the working of God’s Spirit amongst his people. Perhaps the North America bias of this volume has led to a rationalistic debate that robs us of the wonder of knowing that the God who is eternally in mission is also eternally a God of surprises, of paradox and of mystery. It is this that, for me, makes that divine-human relationship, which as Rommen so powerfully reminds us is both the fulfilment and content of mission, so intoxicating impossible to resist.